Gina Keatley, Culinary Dietitian and Television Host will help educate and inform consumers about Malaysian cuisine through the Christmas Ala Malaysia project launching October 15, 2015 in New York City, New York. 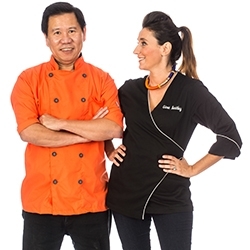 New York, NY, October 15, 2015 --(PR.com)-- The Malaysia Kitchen for the World, an organization which aims to brand Malaysia as a multicultural, dynamic and vibrant country through the varieties of its cuisine, has signed culinary dietitian and television host Gina Keatley as the new spokesperson. As an advocate of culinary adventure and nutrient diversity, Keatley is the ideal spokesperson for program. As a television host and Certified Dietitian-Nutritionist, Keatley spends her time helping others to “Be Fearless, Be Full.” And as the American ambassador of Malaysian cuisine, Keatley will be hosting a series of national media events which will allow guests to experience a flavorful journey into the diverse, wonderfully aromatic flavors of Malaysian cuisine. The media launch will be taking place at the Malaysian Kitchen USA, located at 21 South End Ave, New York City, New York in the beautiful Battery Park City area of Manhattan at 1PM. “I know that embracing a new cuisine can be challenging, but with a few quick techniques and some straightforward instruction you can be whipping up delicious American-Malaysian cuisine before you know it,” adds Keatley. Keatley is recognized for her food-focused television shows, bringing bold culinary conceptions to life, in addition to being an American Diabetes Ambassador and the founder of her own private practice. She has been recognized for work in philanthropy, being named a CNN Hero and L’Oreal Woman of Worth. Additionally, The Women Chefs and Restaurateurs, American Culinary Federation and The James Beard Foundation have recognized Gina for her culinary and humanitarian impact. In 2013, Gina Keatley was honored with The President’s Council on Fitness, Sports & Nutrition Community Leadership Award. To learn more about Gina Keatley please visit http://ginakeatley.com. To learn more about the Malaysia Kitchen for the World program visit http://www.malaysiakitchen.us/. Malaysia Kitchen for the World (MKP), a program under Malaysian External Trade Development Corporation (MATRADE), is the gateway to making Malaysian products and cuisine accessible to everyone by providing information and all-natural food products that come straight from the source. Gina Keatley is a media personality and television host that has been featured on such programs and networks as CNN, Extreme Chef: Food Network, the Dr. Oz Show, ABC, NBC Universal, AFP Global News Network, BBC and more. Her areas of expertise include: diet and nutrition, obesity and diabetes, media health education, guest speaking, and hosting. Having an extensive background with nutritional entrepreneurships – she specializes in bringing bold gastronomic conceptions to life.